As the Legislature prepares to give final approval to a new congressional redistricting map, it's worth considering how the current map has influenced perceptions of representation among the Texas electorate. After all, the debate about redistricting inside and outside the Capitol has centered largely on whether different groups of Texans are getting the representation they deserve and, more specifically, whether the makeup of the state’s congressional delegation serves as a good reflection of Texas’s increasingly diverse population. In what may initially seem like a surprise, polling data from the May 2011 UT/Texas Tribune poll suggest that the social groups in Texas that are most dissatisfied with their U.S. representatives are not racial or ethnic minorities but ideological minorities: liberal and moderate whites. In the May poll, we asked 800 Texans who are registered to vote the following question: “How strongly do you agree or disagree with the following statement: My member of Congress represents people like me.” As the table below shows, they were closely divided in their answers. Nearly equal percentages of respondents reported some level of agreement as reported some level of disagreement. 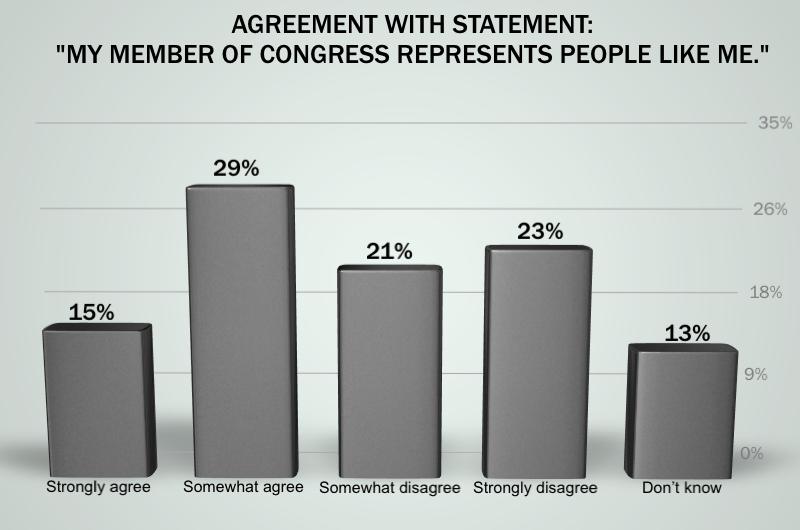 What factors influence Texans’ feelings about whether their congressperson represents people “like them”? One possibility might be race. It has been pointed out repeatedly in the redistricting debates during the legislative session that the racial/ethnic makeup of the Texas congressional delegation is not reflective of the overall demographic makeup of the state: The percentage of white members in the delegation greatly exceeds the percentage of the population that is Anglo. You might think, then, that the bulk of respondents expressing disagreement with the statement at hand are blacks and Hispanics whose representatives are white. In fact, the results of our May poll show that this is not the case. The next table displays racial breakdowns of responses to the same question (to simplify the results, respondents expressing some level of agreement are grouped as “agree” while respondents expressing some level of disagreement are grouped “disagree”). The differences by racial grouping are quite small. A closer look reveals why this might be. First, while the racial makeup of the Texas congressional delegation doesn’t match that of Texas residents, it does a much better job of matching the racial makeup of the approximate universe of Texas voters. 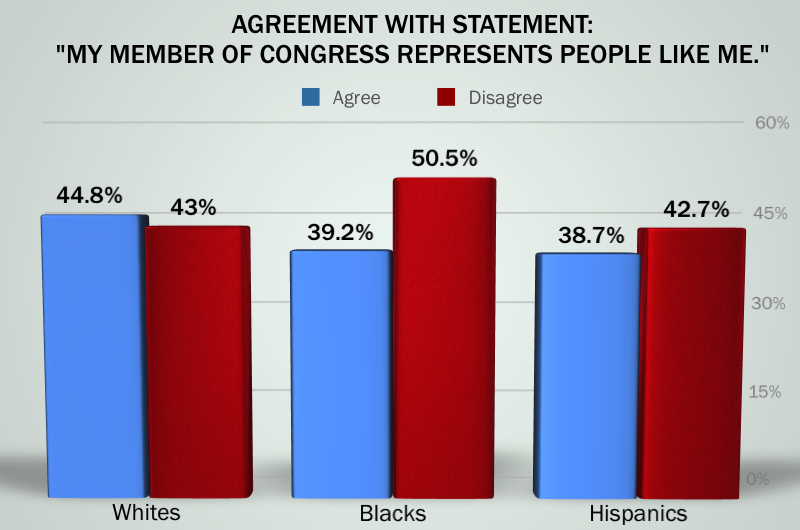 Second, it may be (and is perhaps likely) that the majority of African-Americans and Hispanics expressing that their member of Congress represents people “like them” come from districts whose electoral outcomes are largely controlled by members of their own racial/ethnic group. Texas Republicans took great pains to avoid legal challenges to the redistricting map based on claims of racial discrimination when they crafted the 2003 congressional redistricting plan that is currently in effect. To a larger extent than had been done previously, Republicans packed minority communities in the state’s largest metropolitan areas into solidly majority-minority districts. While it is impossible to match our survey respondents to congressional districts to precisely test this hypothesis, we can tentatively explore whether black assessments of political representation are a result of black electoral control of their districts by comparing the responses of African-Americans in our sample from different parts of the state. According to Steve Bickerstaff’s book Lines in the Sand, which carefully documents the mid-decade congressional redistricting of the 2000s, the eventual plan that emerged in 2003 had dramatically different consequences for African-American communities across Texas. While the plan consolidated many African-American neighborhoods in the Houston area (giving African-Americans effective control of two congressional districts), it gave African-Americans in the Metroplex effective control of only one district while splitting black neighborhoods in Tarrant County into several Republican districts. Likewise, smaller black communities in East Texas were also dispersed into numerous districts so as to prevent the black presence in these districts from being large enough to elect moderate white Democrats. Thus, it's possible that African-Americans in Houston feel better represented than African-Americans in the Metroplex or elsewhere in the state. The table below shows results only for African-Americans, broken down according to whether they come from the Houston area, the Metroplex or elsewhere in the state. 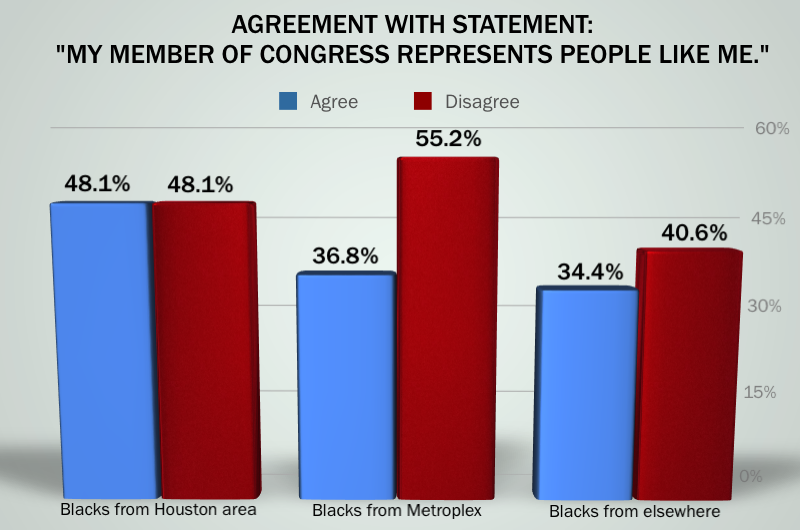 Blacks in Houston are most likely to express that their congressional representative represents people like them, followed by blacks in the Metroplex and blacks in the rest of the state. These differences are not very large and the overall number of blacks in the sample is not large either, so interpret the results with caution. Still, the results do provide some evidence that the 2003 redistricting had an impact on the connection between social groups and legislators. If race alone doesn’t account for much of the variation in our sample with respect to whether respondents believe their legislator represents people “like them,” what does? Our poll results suggest that the best predictor is the respondent’s political ideology — not the ideology of all respondents but the ideology of white respondents in particular. 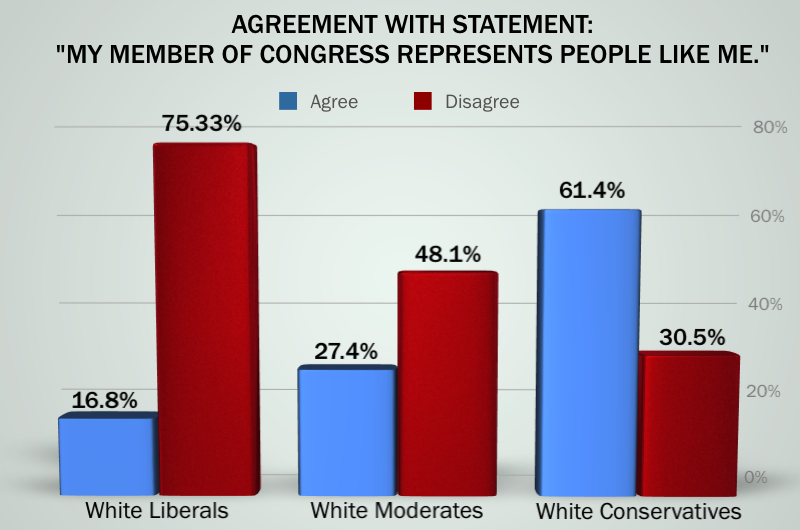 The table below shows the breakdown among white liberals, moderates and conservatives.White liberals overwhelmingly disagree with the notion that their congressman represents people “like them,” while moderates also express considerable disagreement with the statement and conservatives are substantially in agreement. These results make intuitive sense. After all, while federal law protects the electoral interests of racial minorities, it does no such thing for ideological minorities. White liberals and white moderates are a minority of the white population in Texas; they are also far more likely to support Democrats than Republicans. In a partisan redistricting environment controlled by Republicans, their interests are almost certain to lose out. As an unprotected, outnumbered and rather geographically dispersed group, white liberals and moderates in Texas were the foremost victims of the 2003 congressional redistricting scheme — and they are almost certain to be victims of congressional redistricting again this year. It shouldn’t be surprising, then, that they, rather than blacks or Hispanics, are the primary social groups in Texas who feel that they are not being represented well in Washington, D.C.
Adam Myers has worked as a research assistant for the University of Texas/Texas Tribune poll since its inception in 2008. He is a Ph.D. candidate in the government department at UT-Austin. This article originally appeared in The Texas Tribune at http://www.texastribune.org/2011/06/21/polling-center-race-ideology-and-redistricting/.